In recent years we’ve seen huge advances and exciting innovation in mobile data services. There’s a data app for everything it seems. But what about voice? Can plain voice be richer? Yes, it can and there are a growing number of examples from operators around the world. In China, one operator offers taxi drivers a service that allows them to use disposable mobile numbers to take calls from customers on their own device, thus keeping their personal number just that - personal. Other include call barring that can be edited on the mobile, conference calls that can be launched from a browser and shared by social media, and an app that gathers information on events such as theater shows near your location and lets you book online from your phone. The network can even queue for you without hanging on phone. The underlying technology that makes all this possible is the IP Multimedia Subsystem (IMS) core. The IMS core has been around for some time of course, but is now experiencing a second wave of investment as a necessary component in making Voice over LTE (VoLTE) a reality. Furthermore, many original IMS systems implemented by fixed operators are reaching their end of life and will need replacing. 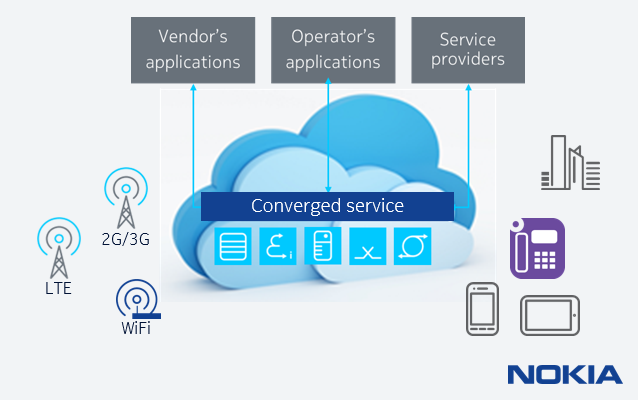 To meet the growing demands, Nokia has released a new, more capable version of Nokia Telecom Application Server (Nokia TAS) that combines voice service functions for all access types - mobile, fixed, converged, and enterprise. One of the most exciting capabilities of the new Nokia TAS is its application development capabilities. With open (REST-based) APIs and integrated Java base Execution Environment, it provides a programmable services environment that operators can use to invite third parties to contribute their skills, or keep more sensitive apps, such as banking, in-house. To benefit from the ocean of creativity exhibited by app developers, many operators are setting up ‘hackathons’ where hundreds of people get involved to find new ways to use the communications services. This may even make it possible to eliminate traditional market research to find the most popular types of apps or their features, saving months. And for those operators looking to update their existing IMS, Nokia TAS enables them to avoid the need for separate IMS cores for fixed and mobile, instead using the one converged solution to cut costs. Being cloud optimized architecture, Nokia TAS reduces turnaround times for introducing new services, getting operators into profit more quickly. Here’s how: It’s extremely scalable and robust across very low to high capacities; it features automated preventive trouble shooting, which reduces ticket resolution time and cost; and common user competencies with harmonized OAM across multiple Nokia VoLTE core products. With Nokia TAS, VoLTE becomes the key to a new world of customized services for subscribers, that can be rolled out more quickly and reliably than ever before. Read more on how Current Analysis has ranked Nokia TAS to be a leader among its competitors. Visit our website for more on Nokia TAS.